How would we achieve this? In my opinion, the best way to advertise the chat (and specific chat rooms) is using them. 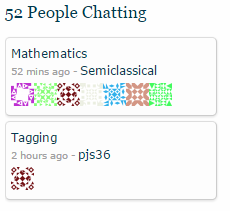 If a user comes to chat and sees the chatrooms associated with math.SE, they might have a peek in some of them. It is more likely that they enter a room where there was some recent activity. If they find out that chat can be useful and/or entertaining, maybe they will come back. I do not know how exactly are the room shown there selected, but based on past experience, usually some of the rooms which recently had some messages are displayed there. So keeping some activity in the room is important if you want to advertise it in this way. The same thing can be said about discussion in the main chatroom. This chat room is often quite busy and it happens sometimes that two or three discussions are going on at the same time. If you have a longer discussion with somebody and it is difficult to follow because there are other things going on, you might decide to continue the discussion in a separate chat room. Again, if this is related to analysis, you can go to the room devoted to this area. Of course, it would be much better if instead of posting just messages which keep rooms alive in this artificial way I would try to create some real activity in those rooms. (Following the advice I have given in the first part of my answer.) But, well, not everything can be ideal. I can at least promise that I will try to do that. The disadvantage of keeping rooms which are not really needed alive is clear - they take space in the list of rooms. But I think that bumping a room once in a fortnight is not really that bad. Related to the previous point - beginners' questions are, as far as I can say, the type of questions which most often get downvoted/close/deleted. If some of such questions are asked in chat (and, ideally, also answered or at least somebody can push the asker into the right direction), this might remove some noise from the main site. And even if the question is not answered in chat, the asker can get some suggestions in chat and which may result in better quality of the question, if they decide to post on the main site after all. (And even if the only thing the user asking in chat gets is some advice how to search and they find out that the question would be a duplicate, that still might help reduce the number of such questions.) Of course, users need at least 20 reputation points to talk in chat, many users posting "newb" questions cannot use chat. On the other hand, some of the users might have sufficient rep from another SE site. Such rooms might help create a community of users which are interested in the topic. For example, it is very probable that each academic year we will have influx of new users who are currently studying calculus (or linear algebra, or multivariable calculus, or some other area). Having some possibility to communicate with other users with similar interests might be useful. One interesting example is commutative algebra. Now we have a room for commutative algebra here. But previously there used to be a room with a related topic here. And in particular this room was very active for some period. Maybe it is just a manifestation of my obsessive-compulsive side, but having single room would somehow "feels" better. There is no doubt that there will be many more users studying this subject. So it is not that unlikely that even if the current room is frozen, a new room for commutative algebra might be created again.